If you’ve ever been in a casino and noticed 1 table that seems to be drawing a crowd and is making all the noise, it’s more than likely the craps table. Craps is a dice game that is loud and fast. If you’re looking for a heart pumping adrenaline rush and big swings, craps just might be your game. 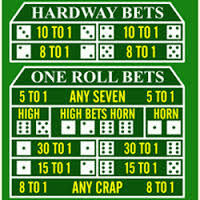 Because craps has so many different bets that can be made, it can be a bit overwhelming and confusing to the rookie. Below we’ll break it down for you so that you’ll be able to jump right in the next time you visit your favorite establishment or online casino. You’ll also find who makes the cut to land on our top 5 list for the best bitcoin sites online, so you know where to play once you learn and understand the game. Very simply, you’re betting on the outcome of the roll of the dice. I won’t get into what dice are as you have probably come across these little white cubes with numbers on them before, lol. Each die, or single dice, has dots, or pips, from 1 – 6 on them. 2 die are used in craps, therefore the total of the pips from each die are added together for each roll. For example, if you roll a 5 and a 4, then your roll has a value of 9. There’s only 36 possible outcomes for each roll. This is based on how many combinations of the dice there are for each particular number that can be rolled. For example, there’s only 1 way to roll value of 2. That would be with a 1 and another 1 for the total of 2 for that throw. Unlike 7 which has 6 possible combinations that can total 7 ( 6 & 1, 1 & 6, 5 & 2, 2 & 5, 3 7 4, and 4 &3 ). The craps table is a long and narrow felt covered table with many different numbers and sections on it. At first glance it can be overwhelming but it’s really just the same layout on both sides of the table. Depending on where you’re standing at the table ( in a live casino ), all of your bets will be handled on only 1 of the sides. This helps the dealers keep everybody’s bet separated and organized. There’s a foot high ridge that runs around the edge of the table allowing the dice to be rolled and stay on the table. On top of the rail is where each player keeps his chips for easy access. There’s also not any chairs. All the players simply stand around table except for the side that the dealer is on. The exception is when you’re playing bitcoin craps from the comfort of your own home or mobile device, where you can sit anywhere you’d like, lol. We’ll get into each section of the table shortly. Typically there are 4 casino staff that handle each craps table. Dealer: There’s 1 dealer at each side of the table for a total of 2 dealers. There job is to help you place your bets on the playing surface and to payoff winning bets. Stickman: 1 stickman stands at the center of the table with a long putter shaped stick. his job is to retrieve and deliver dice to the shooter, or person currently throwing the dice. He also announces the results of each roll to the table as they happen. He will also help in placing bets in the middle section of the betting area. Boxman: Usually in the center of the table, the boxman is the real boss of the game and overseas the entire game including the actions of the dealers and stickman. He also keeps his eyes on the players and the dice to make sure there’s nothing funny going on. The shooter is the player that is rolling the dice for the entire table. The same shooter will continue to roll the dice until he or she craps out , or rolls a losing number. This is the same whether you’re playing in a casino or playing bitcoin craps online. At this point, the dice will move to the player immediately left of the previous shooter, and this will become the new shooter. This pattern continues this way clockwise around the table. If you are the next shooter in line and don’t feel like throwing the dice, you can pass to the next player in rotation. Throwing the dice is where lots of the adrenaline comes from so I would highly recommend giving it a try. If someone happens to roll and 1 or both of the dice fly off the table, the stickman will announce ” no roll ” and will not affect any of the bets. The shooter will then get another try to roll. Use only 1 hand when handling the dice. The casino needs to make sure that you’re not altering or changing out the dice to aid in cheating. Try to toss the dice correctly. A long throw that bounces off the back wall is best. This helps assure that the outcome is truly random. You’re not allowed to slide the dice down the felt. Every time there’s a new shooter, a new game starts. Each game will continue until the shooter loses. Before a new game starts, each player at the table will make a line bet. This bet will consist of either a bet on the ” Pass Line ” or ” Don’t Pass ” line. The pass line is a way of betting that you think the shooter will eventually roll his winning number to end that particular game. For example, the first roll for the shooter is called the come out roll. If on this roll he throws a 6, then he would need to eventually roll a 6, or hit his point, before crapping out by rolling a 7. If he does this successfully, everybody that bet the pass line will get paid for the initial bet made before the new shooters first roll. on the other hand, the don’t pass bet is saying that you believe the shooter will not hit his point made on the come out roll before he craps out, or rolls a 7. If you bet the don’t pass and are correct, you will get paid and all those who bet the pass line will lose their original bet. These 2 line bets are just used to start the game and there’s a variety of bets that any player can make after that to take advantage of ant number that he thinks the shooter will roll from there on out. Making a Point: The point is established on the above mentioned come out roll, unless that roll is an automatic winner or loser. Rolling a 7 or 11 on the first roll is a winner and pays everybody with bets on the pass line. A roll of 2, 3, or 12 on the first roll is a loser. Pass line bets get taken and the don’t pass line bets get paid off. If the first roll is anything else like 4, 5, 6, 8, 9, or 10, that number is their point. Once a point is established, the only 2 numbers that will end the game are 9 and 7. If the shooter rolls a 9 then he and everybody on the pass line win their bets. If he craps out, or rolls 7, then he looses and all the money bet gets taken away except for those that bet the don’t pass line originally. It’s that simple. The dealer will mark the point with a big marker puck so the entire table will be aware of what the shooter’s point number is. Because bitcoin craps offers many different types of bets to the players, you really need to understand what the bets mean and their odds before you decide to place them. Below I will give an overview of each different bet so have the information needed to make good decisions. Pass Line: like stated in the last section, this is one of the 2 original bets that are made before a new game starts. 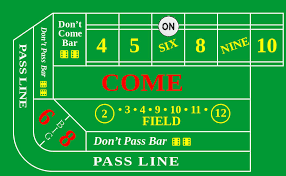 You cannot place a bet on the don’t pass line before the original come out roll. This bet becomes off limits one a point has been established. Come Bet: After the initial come out roll and a point is established, you can then put money on the come bet. This will allow you to treat the shooters next roll as on original and new come out roll. You can do this several times if you want. This is essentially placing a second pass line bet, so all the details of the pass line above are applied here. Odds Bet: This is one of the best bets in the casino as it offers additional odds on the point being hit. This spot is located directly behind the pass line spot on the felt. It’s the spot between the pass line and the rail. Once a point is established on the come out roll, you can place a wager in this filed to get rewarded with those extra odds if the shooter hits his point. You will get paid on both your pass line and odds bets. If the shooter craps out you will lose both. This next section covers the ” prop ” or ” proposition ” bets that are commonly referred to a the sucker bets. The prop bets are bunched together in the middle of the betting layout. These bets are fun and have big payouts which are enticing, but should be avoided most of the time. Seasoned and professional gamblers stay away from these bets because the house edge is way to big. Whether playing live or online at your favorite bitcoin friendly casino, try to stay clear of these bets if you’re serious about having a winning session. 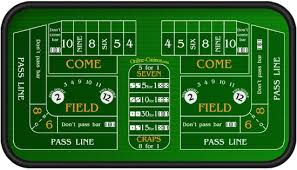 Field Bets: Field bets are located right in the middle of the layout on both sides of the table. These bets pay even money and are only one-roll bets, meaning this bet is only good for the next roll. The field bet can be placed anytime after a point has been established. If you bet the field and the next roll is a 3, 4, 9, 10, or 11, you win even money. If the roll is a 2 or 12, which pay either 2 or 3 – 1. This bet seems like a no brainer, but the brains playing craps stay away from it because of it’s over 5.5% house edge. Any 7: This is a one-roll bet that only pays if the next roll is a 7, everything else loses. This pays 4 to 1 and the house edge is a staggering 16.7%. 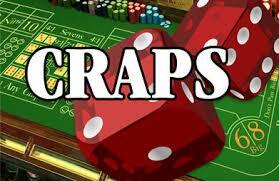 Craps – Eleven: A one-roll bet that the next roll will be any craps ( 2, 3, 12 ). Even though the payout is 8 to 1, the house edge is over 10% and should be avoided like the plague. Horn Bet: A one-roll bet that the next roll will be a 2, 3, 11, or 12, all other numbers are losers. If the roll is either the 3 or the 11, you get paid 16 for 1, and paid 31 for 1 on the 2 and the 12. The house edge with this bet is over 12%. Hard Way Bets: Usually located directly in the middle, this group of bets is offered in 4 ways. The hard way simply means that the number chosen will consist of a pair. For example, betting the hard 8 means that the dice have to come with a 4 and a 4 to win. Rolling an 8 with either a 5 & 3, or 6 & 2 is a loser. This is the same for all 4 hard way bets. You can bet the hard 4, 6, 8, and 10. These are not one- roll bets and can come down at any time. You win if the hard way is rolled before the shooter hits the point with another combination or before he rolls a 7 to crap out. You lose if the shooter hits the point with another combination or craps out before he hits his point all together. These rolls pay out between 8 & 10-1 depending which hard way number you choose. Yo Bet: The Yo bet is a one-roll bet that the next roll of the dice will be an 11. There’s only 1 way to hit an 11 and that’s with a 6 & 5. This bet pays 15 – 1if you’re lucky enough to hit it. Stay away! Now test your Bitcoin Craps knowledge for FREE here: Play Craps for FREE! After going through this very clear outline of the fundamentals, you should be able to start getting your feet wet with this lovely and exhilarating game. The types of bets outlined will be the same whether you’re playing in an actual brick and mortar casino, or playing online craps at one of the Top Rated Online Bitcoin Casinos that we’ve already reviewed for you. Choosing the right strategy in this game will definitely go a long way in making you a profitable player. Remember to feel the dice and stay away from the prop bets as much as possible, except when that gambling hunch takes control of your stomach, lol.